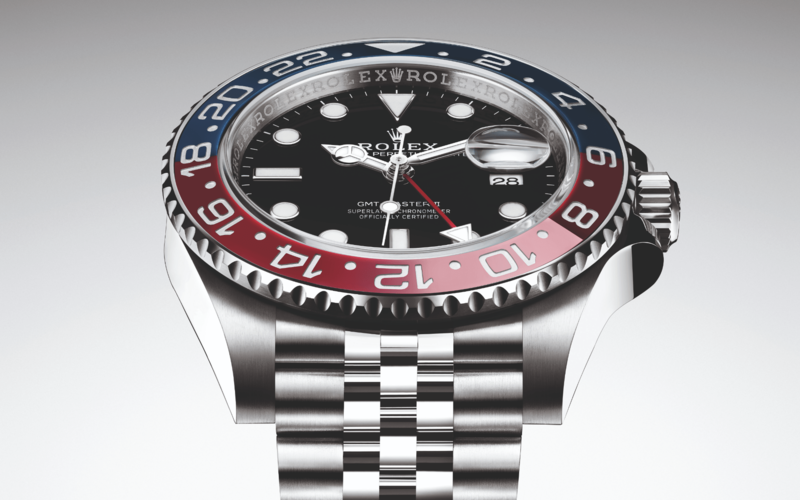 What is a GMT watch? But first, a little background on GMT. The acronym refers to Greenwich Mean Time, which was established in 1884 as the prime meridian against which all other time zones are referenced. The prime meridian is the line of longitude at 0˚; any time zone to its east is ahead of GMT while to its the west is behind GMT. Every 15˚ longitude represents a one-hour difference. Unlike a world-timer displaying 24 time zones, a GMT watch usually displays only two time zones – the home time and the local time. It is also different from a two-time zone watch with only 12-hour scales since a GMT watch has a 24-hour scale, often with the additional AM and PM display. This scale is often found on a rotatable bezel, indicated by a dedicated hand that makes a complete round on the dial every 24 hours. When travelling abroad, one can either maintain the GMT scale as it is for home time or set a second time zone by moving the scale forward or backward to the desired time. Originally created for Pan Am pilots in the 1950s, the GMT-Master is synonymous with travel. The 2018 iteration is crafted in Oystersteel with a patented ceramic bezel in red (for day time) and blue (for night time). The date at ‘3’, enlarged via a Cyclops crystal, is synchronised with the local time. Other solid features include the Triplock winding crown for unbeatable waterproofing (up to 100m), the Jubilee bracelet with five links, and the new calibre 3285 equipped with Parachrom hairspring that is 10 times more precise than a traditional hairspring in case of shocks. Also created for a pilot, this time a crew of the Boeing 777, its most distinctive feature is the sapphire glass bezel. The original watch had a flat sapphire ring; this time around, the engineers have found a way to curve it to better match the domed sapphire crystal of the dial. This watch actually displays three different time zones. Of course, there is the main dial with the usual 12-hour scale, its numerals lighting up in yellow and orange in the dark thanks to micro gas tubes. A second time zone is shown via a 24-hour scale on the dial, which is coated in blue Superluminova. You can read the third time zone on the red-and-black bezel, which is fitted with micro gas tubes that illuminate the 24-hour numerals in green under dim conditions. Limited to 350 pieces, this beautiful Grand Seiko is crafted in a combination of lightweight but high intensity titanium and blue zirconia ceramic that is said to be seven times harder than stainless steel. It is powered by the 9S86 calibre endowed with a fantastic precision rate of +4 to -2 seconds per day thanks to an oscillating weight crafted in titanium and tungsten, a combination that has a high resistance against shock. More on Japanese watchmaking here.